We created this site with the hope that it could serve as a place where the specifics of Niemann-Pick can be made a little clearer…as we know it’s an area that can often be very hard to follow – even for health professionals! Below you will find some useful links that we will be very beneficial to anyone who is looking for further support and information related to caring for someone with Niemann-Pick disease – there is truly a wealth of help and services out there, and we believe part of our duty at NPUK is to make you aware of them so they are readily accessible. There are a wide range of different groups and services which may be able to provide extra support for you and your family. This may be in the form of the provision of equipment (which could make life a lot more manageable), practical solutions (step-by-step assistance to match your individual situation), and much much more! Those listed below boast a wealth of experience between them, and they are all in place to help you…so you shouldn’t hesitate to get in touch with them if you think they could be of service. You, your child, and your family deserve to live a full life. Aparito provide wearable devices and disease-specific mobile apps to provide remote patient monitoring outside of the hospital environment. This delivers meaningful, relevant, and real-time data between patients and clinicians in a way that actively supports and enhances diagnosis, treatment and drug development. By embracing digital health technology Aparito connect patients to doctors – and to parents/ carers – via remote monitoring to support better patient outcomes, improve understanding of disease, and clinical trial outcomes. To learn more about their work please watch the video below, or visit their dedicated website here. The Advisory Centre for Education (ACE) is an independent advice centre for parents, who specialise in offering information about state education in England and Wales for 5-16 year-olds. Their information they provide aims to give parents up to date knowledge of law and guidance, which can often be confusing for many of us. They also offer practical and tactical advice on how parents can best work with their child’s school to resolve any concerns – this can span a wide range of educational issues, including those which may be prompted by a child who has Niemann-Pick disease in any of its forms. Connexions Direct offers advice on a range of different subjects including; education, careers, housing, money, health and relationships for 13-19 year olds in the UK. These can be rather bewildering matters for everyone, especially for young people – so Connexions Direct continually strives to provide support in the form of web chats, phone calls, and call-back options to provide insight and advice on these subjects. Founded in the 1970s by families of disabled children, this charity understands first-hand how important it is for those who share this experience to support one another. So for many years they have provided invaluable information, advice, and support for families – and have also brought people together so that they can support one another even further. They also campaign to improve the circumstances of all disabled people, and for their right to be included as equal members of society. This is the UK government’s recommended approach to co-ordinating services across the country for families with young disabled children. The central support team at the National Children’s Bureau is responsible for ensuring that this ‘Early Support’ programme is extended from birth to adulthood, so that people can grow and develop with the best level of care and support as possible. To make this a reality, the team offer practical resources, as well as key working training to help practitioners and managers put children, young people, and their families at the centre of service delivery. To put it simply they want to make it possible for disabled people to live ‘ordinary lives’, so that with their help they can make informed decisions, and become actively involved in their own care. Enquire is the Scottish advice and information service for additional support for learning. They offer an amazing service through their website, online enquiry service, telephone helpline (below), and email (also below) by offering impartial advice and information to parents, carers, practitioners, children, and young people about how pupils should be helped to get the right support to be successful learners. Inclusive Science and SEN aims to enable the sharing of good practice and positive ideas relating to science education for students with special educational needs. They gather together a wide variety of activities, games, quizzes, investigations and interactive resources – all to make science education more accessible for those who may need additional support. They also regularly display findings of research that has been undertaken in order to support teachers, along with the wide selection of materials they offer, enables and encourages teachers to better adapt class activities to their students’ individual needs. IPSEA is a registered charity covering the whole of England. Through grants and donations they are able to provide vital information, advice, and support to thousands of families each year. Their website has hundreds of free downloadable resources to ensure families with children who have special educational needs, get the best education possible. One service which IPSEA offers is their Tribunal Support Service – a volunteer-based organisation that provides telephone advice and support to parents of children with special educational needs. Tribunals (those on the other end of the phone) are all parents who have been helped by IPSEA in the past, and so can impart their wisdom with the benefit of their own experience. NASEN is one of the UK’s leading organisations when it comes to promoting the education, training, and development of all those with special educational needs. They publish up-to-date and high quality research, provide information, advice, and guidance – and also deliver outstanding professional development for education professionals. The NPPN rightly believes that those with additional learning needs and disabilities should have direct access to education of the highest quality – they should not be at a disadvantage, and should never be overlooked. Instead every human being should be provided access to personal, social and intellectual development, and must also be given the opportunity to realise their own learning potential. The National Parent Partnership Network (NPPN) is established under the aegis of the Council for Disabled Children to support the work of the parent partnership services, and is funded by the DCSF. Together they promote the interests of those with special/additional educational needs and/or disabilities, and encourage a number of different approaches including motivating, engaging, equipping and supporting professional practitioners and policy makers. Portage Home Visitors are employed by local authorities and charities to support children and families within their local community. They provide regular home visits, they support the development of play, communication, relationships, and promote the learning for young children within the family. The Portage model of leaning supports the child and family’s participation and inclusion within the community in their own right, and allows for a cohesion between parents within the family and others in the local area. In order to collectively work towards properly resources education for children with SEN, a national network of parents was formed – which is now known as Network 81. There is strength in their sense of community and togetherness; it is this which has powered them from day one. Ever since its formation they have offered information, advice, and signposting to parents on all matters relating to special educational needs and disabilities in both England and Wales. They aim to not only educate the parents of such children so that they can be more aware of their educational needs, but also to advance the education of all children with special needs. There is strength in numbers, which is why Network 81 continually link up and support groups and individual parents of children with special educational needs all across the UK. In turn together they raise awareness and publicise good practice in inclusive education, encourage parents to take their rightful place in education policy-making, and promote parent-professional partnerships. The Parents Inclusion Network (also referred to as PIN) is a group of parents and carers who all have (or care for) a child with a disability. This charity was set up by parents, for parents, in order to promote the learning and development all of their children require both in schools and throughout life. PIN believes the solution to how to assist children with disabilities is simple – just bring people together! In fact it is this relaxed and informal connection of parents and carers, all who share in a similar experience, who can offer real and invaluable support. PIN also offers advocacy and support (through their telephone helpline), peer support, education and training workshops, and much more. This is where SEN and Disability Tribunal can help! They are in place to assist parents whose children have special education needs appeal to the Special Educational Needs & Disability Tribunal against LEA’s decisions regarding their educational arrangements. The tribunal is independent of government, and will listen to both side of the argument before making a decision which makes for a fairer outcome for all. Contact a Family is a fantastic charity for families with disabled children, which provides information, advice, and support on a national level. They campaign together to further their collective interests, and in doing so support each other whilst working towards a shared goal…caring for those who have, and care for, children with disabilities and learning difficulties. By bringing families together as one Contact a Family can better support those which it seeks to help, and by campaigning under a single banner they are better placed to improve the circumstances of disabled children nationwide. It is their ambition that children with disabilities will not be ignored, and that instead they will be included and equal in society. The Department for Work and Pensions (DWP) covers a lot of different benefits and services, many of which can be of great help to individuals and families with disabilities (e.g. they are responsible for welfare, pensions, and child maintenance policy). They are the UK’s largest public service department and administer the state pension, a range of working age, disability, and health benefits to well over 22 million claimants. They provide their core services in a number of ways, including Jobcentre Plus, The Pension Service, the Child Maintenance Service and numerous partner organisations. All children, no matter who they are, should have the opportunity to play, learn, and develop in an environment that is suitable to their individual needs and abilities. But unfortunately for parents of children with special educational needs and disabilities, accessing the right level of support and information can often prove to be incredibly frustrating. As Niemann-Pick diseases are so rare, it is important to share as much relevant information as possible with those who take care of your child – as even a basic knowledge of the symptoms, progression, and practical management of the disease(s) can assist greatly in creating and supporting an optimum learning environment! It’s also imperative to remember that Niemann-Pick diseases are variable in terms of symptoms and progression, and that this can present many challenges in the classroom. Therefore the support each affected child requires is individual to them, and in accordance to the degenerative nature of the disease, this may change over time. But don’t worry: these challenges can be overcome if parents, teachers, and other professionals work together with you and your child. Here at NPUK we can also help by providing specific information to support your school, and can arrange an educational workshop for teaching staff if appropriate. We have created this group on Facebook to provide an open forum for the sharing of experiences, ideas, struggles, and everything in between, when it comes to caring for an individual affected by Niemann-Pick disease. The focus is on the men in our community, both those that are affected directly, and those that are affected indirectly (friends, extended family members, teachers, etc) – led by NPUK Project Families Officer Steve Neal, the group provides a holistic balance between help and support, and inspiration. It is our hope that by coming together, we can be stronger! For further information and to get involved please get in touch by either email at: info@npuk.org, or by phone on: 0191 415 0693. Secure Mind Solutions is the result of Founder Gaz Anderson’s many years of training in different and complementary change-related therapies and disciplines, and much life experience. For further information, you can contact Secure Mind Solutions by either phone on: +44(0)7502 590628 or by email at: info@securemindsolutions.com. “…Through my work as a counsellor I have encountered a wide range of clients with an equally wide range of presenting problems. These range from anxiety, compulsive disorders, depression, relationship issues, stress, panic attacks, bereavement, confidence and self worth among-st others. I am very passionate about counselling and have been privileged to share in my client’s journeys as they change their lives. This work is not always easy but the rewards are truly immense. I’ve previously served as a firefighter for 17 years, and have worked as a therapist for the past 13 years, travelling the United Kingdom and Ireland teaching conflict management in hospices and mental health as well as running my own private practice, I also run stress management courses for local universities and teach conflict management to front line NHS staff. I offer a confidential and safe environment to explore and make lasting changes. Following death, grief is a completely natural part of the process that helps you deal with all of the emotions that you feel when losing a loved one. Depending on the circumstance you may feel a number of mixed emotions including; anger, frustration, sadness, guilt, and even in some cases, relief. At this time you may wonder how or why everyday life is carrying on around you…and the future can seem bleak and without promise. But with NPUK you are truly never alone, and we will help you with every step along the way. However it is important to remember that grief affects us all in very different ways – so there is no ‘normal’ when it comes to grieving, and therefore no one should dictate to you how you should feel as only you know exactly what you are going through. It’s also important to keep in mind that each and every person has a different way of grieving, and as a result emotions can be variable, ranging from overwhelming despair to bursts of high energy – all of which are perfectly acceptable. Many share their current situation with close loved ones in their personal lives, some of whom may be struggling with similar emotions and can therefore relate to their present circumstances. Whereas others appreciate speaking to a dedicated bereavement counsellor, a person who is trained and experienced in providing comfort and support for those who have faced loss. Many people feel unable to express their feelings straight away, and instead need time to deal with their grief internally before they are able to vocalise it to others. But whatever your grieving process at NPUK we are always here to help you, by phone, email, or in person at any time. In 2012, following a request from a number of families, we introduced the ‘Reflections’ support group, which was set up specifically for those whose child or loved one have passed away – a situation which is sadly all too common for those who are affected by Niemann-Pick disease. The main aim of this group is to combat the loneliness and isolation that can occur as a result of diagnosis. The group strives to provide a safe and welcoming environment in which people who are going through similar experiences can support one another. The Reflections group meet at our Annual Family Conference, which is held in September each and every year. However smaller group meetings, as well as individual one to one sessions, are available at other times. “When we got home we continued to talk about our loss. It has made me feel so much better”. 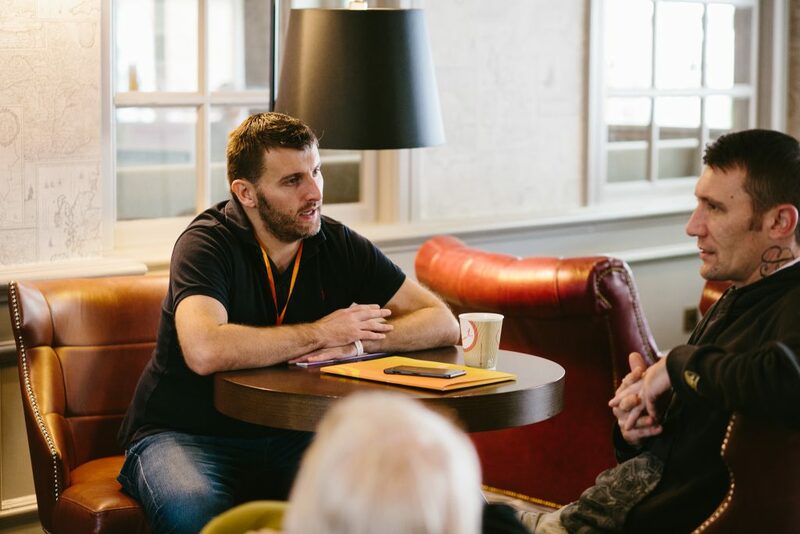 During our Conference, the Reflections group have their own room to themselves – a space away from the main programme where they can meet together privately, and talk freely. This room is made available throughout the Conference weekend, enabling participants to relax and to have some quiet time in an informal and relaxed atmosphere; in which you can participate as much or as little as you wish. If you would like to find out more about the Reflections Group, please contact our Families Officer at any time. Child Bereavement UK support families and educate professionals when a baby or child of any age dies or is dying, or when a child is facing bereavement. They offer a face to face bereavement support service for families where a baby or child has died or where children and young people, up to the age of 25, are bereaved. Child Bereavement UK are also able to support families who are facing bereavement, where a child of any age is not expected to live, or where children and young people are facing the bereavement of anyone significant in their lives. The charity was founded in September 1994 as The Child Bereavement Trust by Jenni Thomas OBE, who worked with the charity for its first 15 years. The work of the charity was launched and established with Julia Samuel MBE as Founder Patron at the Royal College of Nursing, in the presence of Diana, Princess of Wales. The charity is honoured to have the patronage of HRH The Duke of Cambridge. Cruse Bereavement Care is the leading national charity for bereaved people in England, Wales and Northern Ireland, offering support, advice and information to children, young people and adults when someone dies and working to enhance society’s care of bereaved people. Cruse offers face-to-face, telephone, email and website support. Cruse also hav a Freephone national helpline and local services, and a website (hopeagain.org.uk) specifically for children and young people. Cruse’s services are provided by their network of 5,000 trained volunteers and are confidential and free. Cruse also provides training and consultancy for external organisations and for those who may encounter bereaved people in the course of their work. Face-to-face and group support is delivered by trained bereavement volunteers across across England, Wales and Northern Ireland. Cruse also offer information, publications, and support for children. If someone you know has died and you need to talk, you can call freephone on: 0808 808 1677. The helpline is open Monday-Friday 9.30-5pm (excluding bank holidays), with extended hours on Tuesday, Wednesday and Thursday evenings, when Cruse are open until 8pm. Respite care can provide a welcome break from caring, as it gives carers time for themselves safe in the knowledge they are leaving their loved ones in the care of experienced carers. Replacement care is designed to replace the care that you, as a carer, would normally be giving the person you care for. It may be needed so you can look after your own health and well-being, but can also simply provide a break from the stresses that constant caring can bring. For example, it may be that regular replacement overnight care is needed so you can catch up on your own sleep.